Latest post Wed, Aug 22 2018 10:04 PM by greatfox. 20 replies. Hello, getting the attached error on first launch. I also have PT 12.6.0 currently installed and working fine. System is Core i7-3770k with 16 GB, Nvidia GTX 670 on Windows 7 SP 1. Does this program and PT not play well together? If so, MC loses that battle. I am running Pro Tools 12.7 and Avid Media Composer 2018.4. 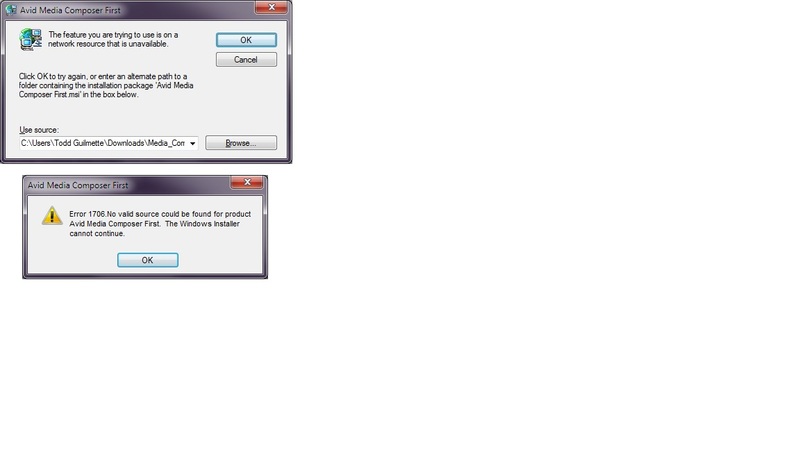 I installed Pro Tools (first) in that order not Pro Tools First the software as Avid states in the faq abiut co-install. I then install Avid Media Composer and all is working fine. I am on Windows 10 however on Windows 7 even on just Windows 7 with sp1 and all the windows updates. Pro Tools 12.7 and even upto 9 and verison 10. It would hang on initilising midi engoie for around 10 mins before it finally opens Pro Tools to do anywork. Under Windows 10 it loads perfectly Pro Tools 12.7. Here's a link with Marianna from Avid answered about the error which a user had previous as she mentioned that something went wrong with the install. You could try re-downloaing the Avid Media Composer Installer again form Avid. Once download try unzipping the file you can use 7zip as seems faster and try installing again. Can you do a backup of your system with Acronis backup? So you have a working backup as it is now. 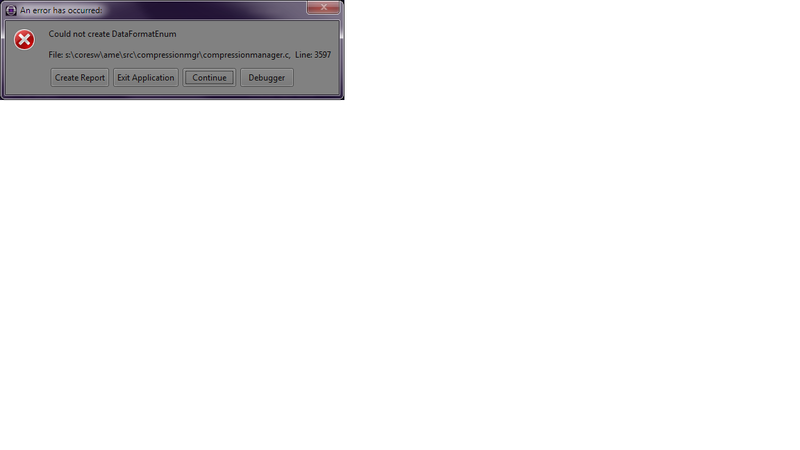 Then try to uninstall Media Composer, first de-activate then uninstall and re-install? You could also try if you get the same issue install Pro Tools, re-boot then install Pro Tools (first) reboot then install Avid Media Composer. If all works could of been the instal order I am not to sure what effects errors or issues instaling them out of order would do to errors like you are shwoing in the screengrab. I think the reason Pro Tols gets installed (first) is to do with Avid Media Composer sharing the same audio engine and plugins as Pro Tools, so if the install order is n ot Pro Tools then Avid Media Composer then maybe a certian file gets over written or can't access both possibly. Hi, I tried uninstalling MC and the app manager, rebooting, downloaded another copy of the installer, installed, same error. The error occurs while the program is appearing to load the plugin "codecmanager.avx". No one knows the answer? These two programs from the same company should be able to work on the same computer. What codecs do you have installed on that system? In particular, have you loaded any codec packs from 3rd party sources (like AngelFire or K-Lite)? If you move the Plug-in folder for video to the desktop, does it launch? Hi, which folder is that? I tried moving the AVX2_Plug-ins folder. When I launch MC, it starts to try and reinstall the program! It's like it sees the folder missing and wants to repair it. Wow, 400 views and no one else has this problem? Wait, I get it! All of us First users are just free beta testers of the real software version that you have to pay $20 a month for! I get it! Sneeeeeeaky!!! Actually the paid users are the beta testers for the free version of the software. We've been beta testing it for years (and I'm gonna get a smackdown from Marianna for that one)!! The real truth is, different systems sometimes behave differently. I occassionally have issues that noone else seems to have. It's all very dependent on the system configuration, as well as other software you may have installed. MC was really designed to run against a specific set of known systems and that system be dedicated for MC. Quite a lot of us don't have systems that meet these spec's or have been tested. MCF is really a minorly cut down version of MC. It has a lot of the same restrictions. In fact, it would probably work best on a system supported by Avid for MC (big workstation, lots of memory, workstation class video card, etc.) Which is something I bet most of us wish we had. BTW, I'm a little surprised that MCF is trying to reinstall the application. Do you mean that it's trying to rebuild the plug-in directory? I double click on the shortcut for MC (the same shortcut that launches the program), and I get a dialog box that says "Please wait while Windows configures..." and then I get the attached boxes, top one and then the bottom one when I click Cancel, I get the second box. Can you send me the p[ictures directly or post as Dave suggested?